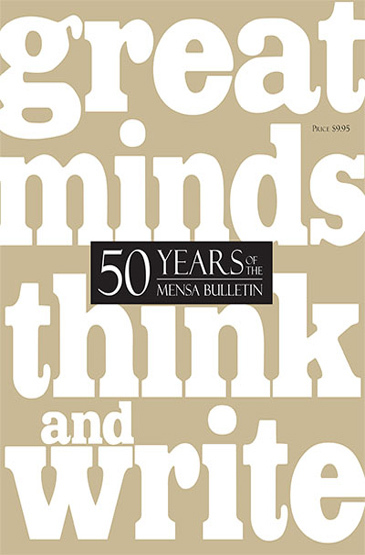 The most brilliant writing from 50 years of American Mensa’s member magazine come together in a new, 100-page publication, Great Minds Think and Write: 50 Years of the Mensa Bulletin. This coffee table-style book celebrates the 50th anniversary of the Bulletin with a handful of the best archives, including poignant personal essays, biting satire, interviews with famous Mensans, science and technology studies, and much more. The previously published articles are paired with all-new, original art from Mensan illustrators, along with introductory overviews of the Bulletin’s different eras. The publication also features past letters to the editor and old classified advertisements that helped color the Bulletin's quirky history. And new compositions, including an essay from best-selling author and Mensan Nelson DeMille, preserve and define the magazine’s legacy.